HWT Geometric is the latest release from the Hamilton Wood Type Foundry- a collaboration between P22 and the Hamilton Wood Type Museum. It is a late 19th century design that conjures up early 20th century Dutch DeStijl lettering with a mostly strict adherence to right angles and minimal stroke modulation. Geometric began its life as a metal typeface from the Central Type Foundry, circa 1884. Soon after, this design was officially licensed to Morgan & Wilcox and was shown in their 1890 catalog in Regular, Light and Condensed Light variations. After acquiring Morgan & Wilcox, Hamilton Manufacturing offered Geometric Light Face Condensed as their own No 3020 and the Geometric Light Face as No 3021. HWT Geometric has been expanded digitally to include a Regular Condensed version. 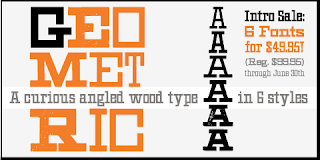 A heavier wood type specimen was found from an unknown manufacturer and digitized as it was found, resulting in the HWT Geometric Shopworn and Shopworn Inked variations. These digital versions all include a full Western and Central European character set of over 380 glyphs. For more information and to purchase HWT Geometric, click here. Special Introductory Pricing. Each individual font in the set can be purchased separately for $24.95 or purchase the full Geometric Set for a special intro price of only $49.95 (for all 6 fonts!). This offer is good through June 30th, 2013. P22 announces format change for all fonts!